This past weekend’s rain was too little, too late, to save Northern California from tight water supplies this summer. Another dry year for the state means farmers will be scrambling for water, and once again pumping from undergound water supplies. But too much pumping has overdrawn some aquifers, causing the land to sink in parts of California’s farm belt. And some farmers are turning to a unique solution. A meadowlark sings on a telephone pole, perched high above rows of gnarled grape vines in rural Madera County. But there’s another way to get a bird’s-eye view of these vineyards. Hill is in charge of 191 miles of levees along the lower San Joaquin River, which can flood in big snowmelt years. Federal and state officials check to make sure these berms are high enough to protect crops, farmhouses and schools. But over the last few years, Hill says, something strange has started to happen. Measurements show the land here is sinking about a foot a year, as thirsty cities and farms pump water from aquifers that lie deep underground, below a thick layer of clay. 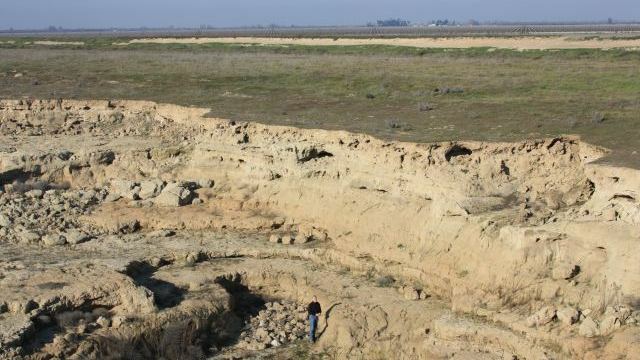 That rapid sinking, called subsidence, is some of the fastest ever measured in the Central Valley, says Michelle Sneed, a hydrologist with the U.S. Geological Survey. “A foot a year is quite fast, and hard to engineer against for things like bridges and dams and roadways,” says Sneed. But what if there were a way to both keep the Central Valley’s taxed underground aquifers from drying up, and the land from sinking? About an hour’s drive south of our levee, on the huge farm known as Terranova Ranch, powerful electric pumps draw well water for about seven thousand acres of crops like tomatoes, grapes, almonds and pistachios. Manager Don Cameron says his electric bill tops a million dollars a year, in large part because those pumps have to work so hard to pull groundwater from wells hundreds of feet deep. Terranova Ranch sits southeast of Fresno in the King’s River basin, an area where farmers are pumping unsustainable volumes of water in dry years. At the other extreme, farms and communities here risk floods when rivers are pulsing with too much water. Terranova is experimenting with a way to address both problems. The idea is to capture excess river water in the occasional big water years, diverting it directly into crop fields, where the water will sink into the ground, and recharge the aquifer. “We’re putting it away when there is flood water available, and essentially storing it underground, rather than building a new dam somewhere, which is pretty unlikely in this day and age,” says Cameron. This is a little different from conventional groundwater “banks,” where farmers share water from an underground aquifer, or buy it from each other. This is an experiment in “banking” water right on the farm where it’ll be used. Two years ago, Cameron worked with environmental engineers and state regulators to flood about a thousand acres of farmland with a foot of water from the Kings River. The water pooled up in the fields, making vineyards look like rice paddies. And that raised a few eyebrows around here. 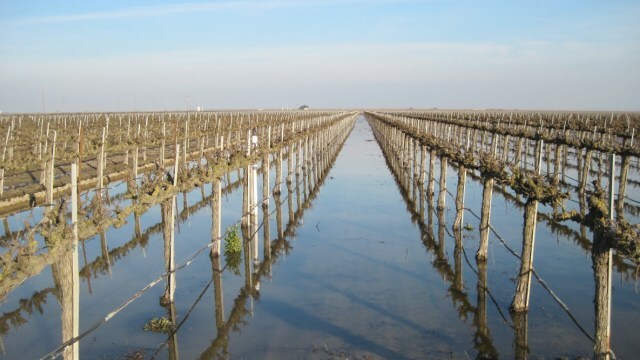 And they still produced grapes — with excess river water that otherwise would have flowed out to San Francisco Bay. The state Department of Water Resources has awarded a grant to Kings River water managers to try and replicate this project more widely starting this year. Meaningful recharge of the aquifers would require a large-scale, coordinated effort. But there’s a catch: it might not work everywhere. Sneed, the USGS hydrologist, says deep under some farms in the San Joaquin Valley are continuous swaths of what’s called “Corcoran clay.” And if you put water on top of that, it could make things worse. “It could backfire,” says Sneed. 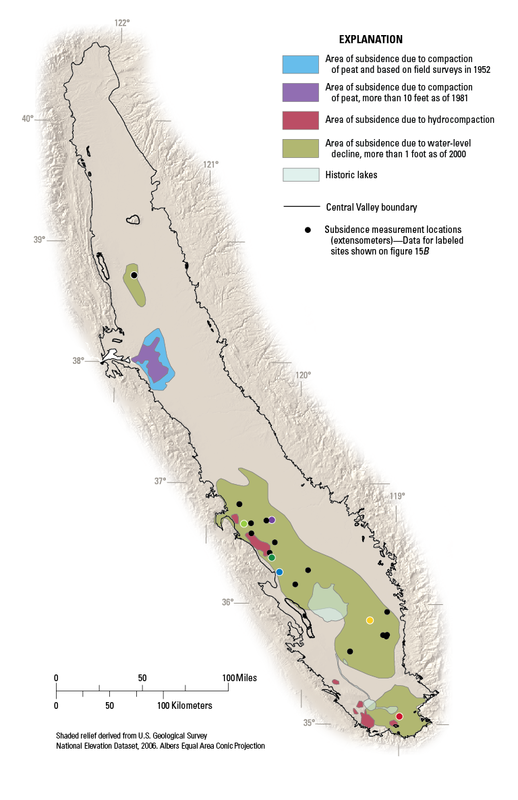 “It really depends on the geology of the area whether that is a good solution or not. Because if water flooding into the fields can’t penetrate through the dense Corcoran clay, it can’t recharge the deepest aquifers where farmers are pumping the most. And the weight of the water pushing down on that clay layer could make the land sink even faster. Sasha Khokha is the host of The California Report weekly magazine program, which takes listeners on sound-rich radio excursions around the Golden State. As The California Report's Central Valley Bureau Chief for nearly a dozen years, Sasha brought the lives and concerns of rural Californians to listeners around the state. Sasha's reporting helped exposed the hidden price immigrant women janitors and farmworkers may pay to keep their jobs: sexual assault at work -- and helped change California law with regard to sexual harassment of farmworkers. She's won a national PRNDI award for investigative reporting, as well as multiple prizes from the Radio Television News Directors Association and the Society for Professional Journalists. She began her radio career in waterproof overalls, filing stories about the salmon fishery at Raven Radio in Sitka, AK. She has produced and reported for several documentary films. Calcutta Calling, about children adopted from India to Swedish-Lutheran Minnesota, was nominated for an Emmy Award. Sasha is a graduate of the University of California at Berkeley Graduate School of Journalism and Brown University, and is the mother of two young children.